"Who does great things, and unsearchable, Marvelous things without number. 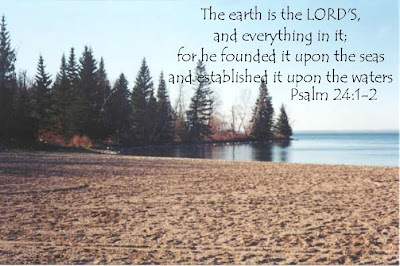 He gives rain on the earth, And sends waters on the fields." The rain began sometime in the middle of the night and I woke to hear the drops falling on the drain pipes. 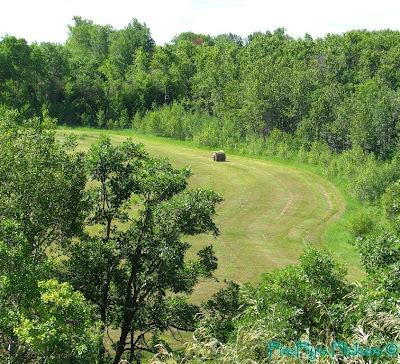 It has been slow yet steady, nourishing the land in ways our man made sprinkling systems cannot. Rain, a simple yet mighty thing, another work of a wonderful God. Just another reason to worship Him. 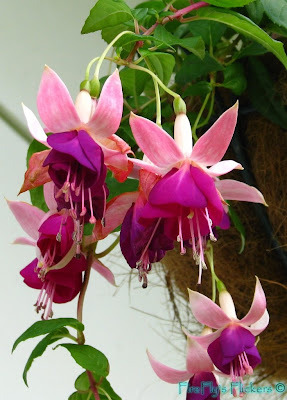 For the last 3 years Rick has bought me a fuchsia plant to hang in a basket just outside our bedroom window. 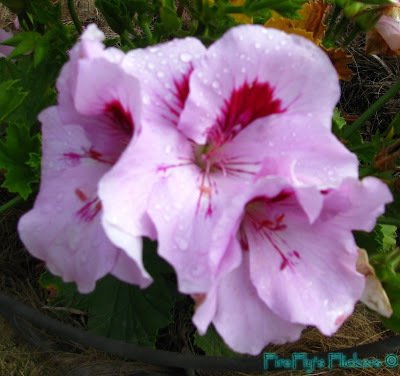 They are one of the most striking flowers I have ever seen and I enjoy watching the blooms change in their process of becoming what they are. 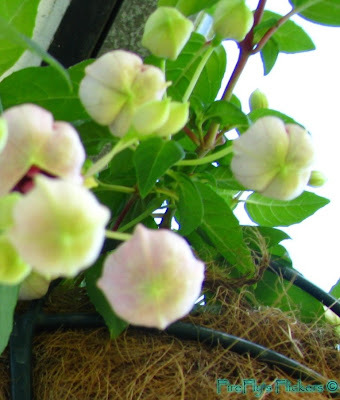 At first the blooms look like pale little lanterns, showing little clue as to what they hide within. At this point I need patience to wait for them to begin opening. The secrets inside begin to unfold. At this stage, the blossoms are unique and colourful. 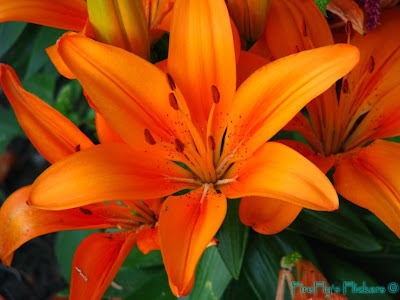 One could be content to have such a flower. Still I know that I must water and wait.. and wait.. and wait, for I know what is yet to be. 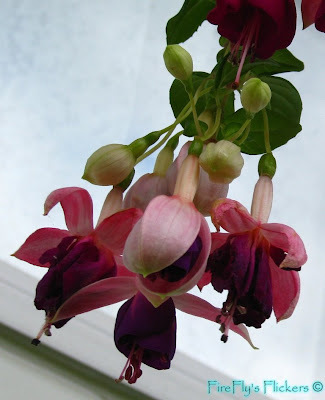 Now at last, at the end of July, my fuschia has blooms that have totally developed and unfurled, revealing all of the potential I knew they possessed. Our loving God looks upon us in a similar fashion. He know who and what He created us to be. He is able to see what we cannot. As we journey on the road to becoming Christ-like He watches and guides us with impossible patience. He loves us beyond measure, but will not let us remain as we are. When we become more than we ever thought we could be, it is to the glory of His Name. Have you ever thought that you had arrived at your final destination only to find there were miles yet to travel? Can you remember a time when you settled for less than God's best for yourself? I know that I have. Today, Lord God I choose to allow You to complete the good work You have begun in me. Today I choose to submit to Your design, allowing You to decide when Your work is completed. Let my life be a testimony to Your patience and love, in Jesus name. If you live in Me [abide vitally united to Me] and My words remain in you and continue to live in your hearts, ask whatever you will, and it shall be done for you. When you bear (produce) much fruit, My Father is honored and glorified, and you show and prove yourselves to be true followers of Mine. they are void of sweetness. in the heart of Christ. that the Lord is so good! 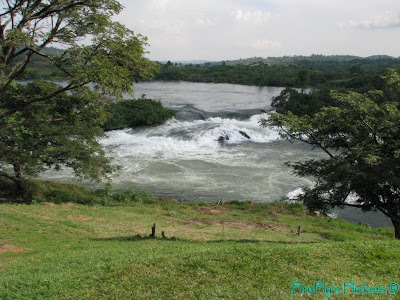 This is a picture we took of rapids on the Nile River in Jinja, Uganda when we were part of the November 2007 Global Build Team for Watoto Childcare Ministries. The waters did indeed roar and thunder and sing praise to our mighty God! In Other Words - Who Am I in the Dark? "marked by harmony, regularity, or steady continuity : free from variation or contradiction"
This is my desire, that my life be free from contradiction. “What you see is what you get.” This is a phrase that is most often used in a negative way. In my quest to live a transparent life “what you see is what you get” is good, and real and true. There may be flaws, look carefully. If you choose to take me, you must take me as I am. Who I am is who I am, who God created me to be, both in public and in the privacy of my prayer closet. I am a work in progress, still raw, with ragged edges. If I attempt to hide those rough spots, I’ll put so much effort into the cover-up that you’ll never really see me, and you’ll also not see Christ in me. If I show you my faith without any of my doubts I betray the truth of a daily walk with my Lord. I desire to live each moment of my day in a way that glorifies my King, so that a world that is watching will not be given an opportunity to cry “hypocrisy” yet again. "a feigning to be what one is not or to believe what one does not ; especially : the false assumption of an appearance of virtue or religion"
Lord God, I pray that You continue to lead me, guide me and teach me to walk in truth; to remove any masks I may have been wearing to gain the approval of man, for the only approval I need is Yours. Strengthen me to allow all of my imperfections to show so that my life may reflect the work You have done in me. May my life be pleasing unto You, Lord God, in the darkness of my private time as well as in my public life, for Your glory and the glory of Your Son. Yesterday was clear and bright and a perfect morning for walking about with Faith at my side (well actually, she tends to run ahead) and camera in hand, thanking the Lord for Who He is and worshipping His marvelous creativity. Come along and walk with me as I head back home so I can share with you this little bit of heaven on earth God gave to us. Rick feels closest to the Lord. senses His presence and voice when working in the garden or spending time out ont he land. 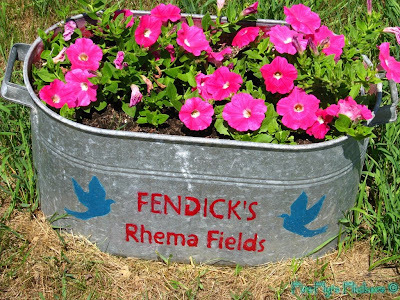 When it was time to give a name to our property, Rick felt it should be called Rhema Fields for it is in this place that we sense the Word of our God. 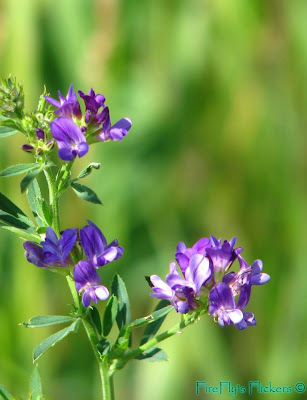 This is alfalfa growing wild along the edges of the road. Rick planted seeds a few years ago in our valley and a cattle farming neighbor cuts and bales the hay in exchange for delicious beef. See the fresh hay bale in the valley? but I can't help notice the beauty of its flowers. 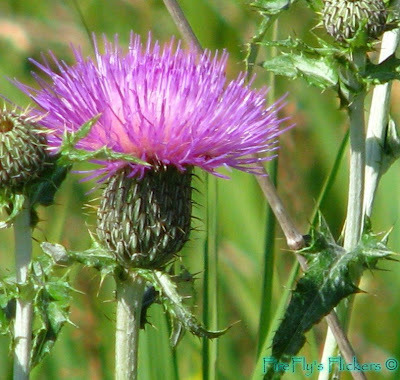 Like the unique beauty of the thistle, I pray that we will always be able to see God's hand at work, even in the midst of trials and struggles. He loves us, He loves you! Have you thanked Him today? On June 15th I posted a vision about "new shoes". Please go read about it by clicking here . Today I stumbled across the following word at Elijah List and was thrilled at the way in which God confirms His Words and visions. The ElijahList - Theresa Phillips: In My Fathers Shoes: "Can You Walk My walk?" and "Can You Wear My Shoes?" I'm in for the Hop! No, I'm not going to Blogher, although Chicago is my home town and I'll be there visiting family in the middle of August. 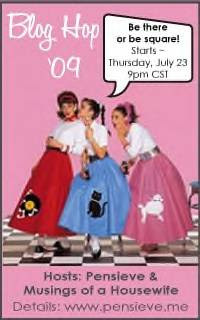 I'm not quite sure I'm ready for Blogher yet, still relatively new at this, have only been blogging for about two years. I'm Karin, known as HisFireFly ("His" meaning God's) and also "his" meaning my beloved husband Rick who coined the name FireFly because he said I reflect the light of God. I fell in love with the name and have used it ever since. I spent the first 43 years of my life living in Chicago and it's surrounding suburbs, not knowing Jesus. I met the Lord, gave Him my life, and He united me with a small town Manitoba man. I moved up North and we now live on 20 beautiful acres in the middle of nowhere which is exactly the somewhere that God desires me to be. My life is now a journey toward radical obedience to whatever God calls me to do, reflecting His light and living for His glory. Looking forward to meeting some new friends as we hop around cyber space this weekend. The question Kim asked last year and again today is: "What would be the title of a book about your life?" "So many answers are swirling about in my mind I don't think I can settle on only one. Moving From Fear to Faith and Freedom"
How would you answer? Join Kim and the rest of us at Cafe Chat and share your thoughts. 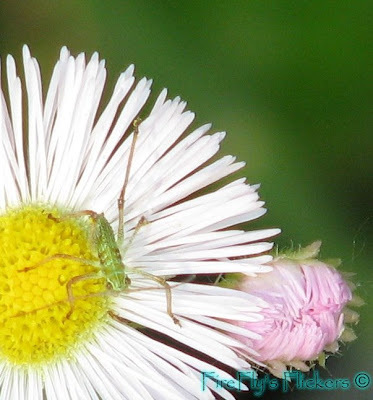 I admit that I do not particularly care for insects, but our God created them and I am learning to find their beauty. We did not even see this creature when Rick snapped the photo. What a hidden surprise. We live on the Canadian prairies. In spring and summer the open fields, ditches and even dark hidden spaces begin to fill with wildflowers of every size, shape and colour. They are not designed and structured like our flower beds and gardens but rather form a pattern of their own. 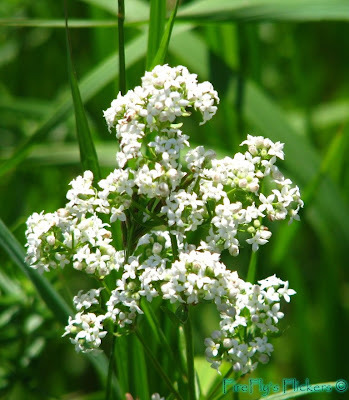 Some grow so out of control they become classified as noxious, invasive weeds. Often these are the most colourful of all. You are My wildflower, My child. And though some may choose to look upon you as if you were a weed, pay no heed to them. I want you to walk in the knowledge of the truth that I created you exactly as you are, My flower, for My glory, wild, beautiful and surrendered to Me. I often need to confess and repent before God my tendency to step into a place of worrying and fear. Not only is there no reason to fret, for He is always there and in control, but such activity merely wastes time and energy and drains out of me the life of joy and excitement my Father desires me to experience day by day. Thankfully His mercies are new every morning and each day He gives me another chance to walk in obedience and faith. I pray that I will step out of His way to allow Him to perfect in me that which will bring glory to His Name. I have always been drawn to moving water; waves, rivers, waterfalls. There is something magnetic in the sound, whether it is a trickle or a rush. There is life and freshness and renewal in the unceasing movement. The water remains active, for there is no passive way to manuever around rocks and sticks, changes of direction and other obstacles. Should the water decide to stop working, the obstacles would soon create a damn and all would grow stagnant and lifeless. So it is with us. There are always going to be trials that appear before us, beside us and around us. Jesus promised us that we would indeed have troubles. But we have a choice in how we react to those troubles. We can choose to become overwhelmed by fear and stop moving forward. Soon the problems begin to pile up so high that we cannot move in any direction at all. There is another option. We can choose to allow God to strengthen us to face what surrounds us, trusting in His unfailing love and grace that works in us. Sometimes God will remove the rocks; sometimes He will whisper in our ear and give us the strategy to move around the rocks; and sometimes He will fill us with enough power to simply flow in a mighty rush right over the rocks. In any case, we overcome and continue moving onward. 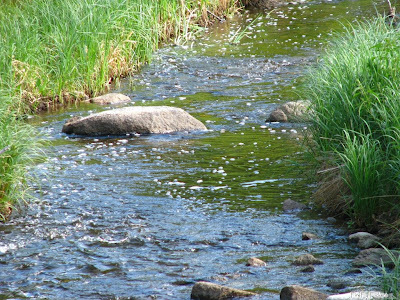 I thank God for the rocks, pebbles, sticks and stones for without them I could never hear the waters sing with joy. I'm joining Extravagant Grace for Word Filled Wednesday. Come join us and soak in the beauty of the Word! I went for a walk with the dog (and the camera) this afternoon, when the rains had finally stopped. The air is cool, but fresh, and the colours of everything seem polarized and alive. 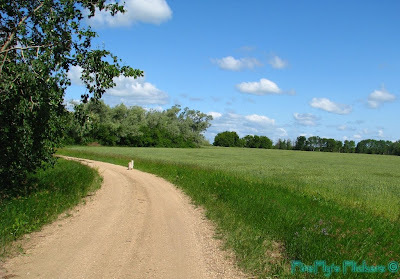 What beauty there was in the sky and the lushness of the fields beside our acreage. 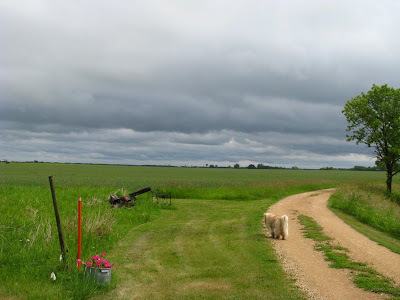 Faith was still, watching for the ground squirrels that are also finding a place to make themselves a home on our land. This is beautiful land that I am blessed to inhabit right now, but it truly is not my home. My resting place will be with Jesus and the Father. When I remember that simple yet profound truth I find it easier to release the tight grip I may try to keep on the things that I can see and hold now. Instead of trying to pretty this up, or change any part of the encounter, I will simply share a journaling session I had with the Lord yesterday. "I don't know where I'm headed Lord and can only trust that You do. I seem to avoid doing those things I believe I should - writing and finishing my course. Do You know what I am afraid of? I know I have the ability to complete the tasks, for You gave me these abilities - so I know if I persevere I will not fail. Why then am I so afraid to succeed? Is it fear of what the next item on the list would be? Lord God I want to be willing to do whatever You ask. Forgive me for any stubborn attitude that may still rage in me. Search me, show me the errors in my thinking, the rotten places in my heart." "You're afraid of pride, little one, so afraid that you don't even want to draw near the edge of that pit. Can you see that if you don't accomplish anything you think you have no need to fear becoming prideful. Are you proud of Me? What I work in you and through you is to glorify Myself. If you don't allow My work to be made manifest in your life you actually rob Me of glory. I know this is not your intent is it? But it all becomes confused. I am healing you of your need for man's approval, but that does not mean you should not shine before man. Be MY glory, as My trophy." "I so do not want to rob You, Lord, or disappoint You. Help me to be all that You created me to be, the work of Your hand and Your heart. Let me learn to boldly wear the stamp of the Master." My aging mother is suffering with a paralyzed vocal cord. What at first she brushed off as laryngitis persisted for long enough that she finally agreed to see a doctor. Cat scans showed that the cord is paralyzed because a lymph gland is enlarged and pressing on a nerve. Not sure what is causing the enlargement called for more tests. The last few weeks have been a time of waiting and questions and more waiting and more questions. Yesterday was perhaps the most difficult as she went in for a biopsy of the lymph node. 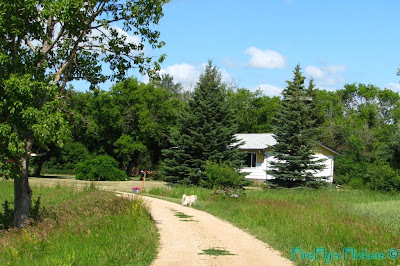 My folks live in the northwest suburbs of Chicago, while I'm now in rural Manitoba. It's a four hour drive to the airport in Winnipeg to take a dearly priced two hour flight. These are the moments when I feel the distance between us most acutely. My brother who lives near them took Mom to the hospital for the test which would be done under general anesthesia and I was left to wait alone for phone calls to keep me informed. Time stretched on slowly with no word from my brother. I paced, I cried, I tried to distract myself, and I always came back to prayer. I prayed for my father as well, who lives in a care home with dementia of an unknown variety and expects my mother's company all day and all evening, every day. She has gotten him used to this routine and change upsets him. I prayed for their salvation again, as always, for time indeed is short and they have not met my Jesus. Perfect peace? I knew I could certainly use some of that. The sceptical side of me (the voice of the enemy speaking lies into my mind) said "How does that work? It's not possible" but I didn't listen to that twisted voice. I chose instead to trust my Lord and focus my attention of Him. Sure enough, as I began to glorify His name, all that concerned me diminished as He was magnified. I knew that whatever the outcome of the day would prove to be, He was in control and He had a plan and soon all was well with my soul. Pathology reports should be ready in a few days. The doctor said he could find no cancer, in the lymph node or the lung. That's the good news. Now back to searching for a cause of the troubles. More tests, no doubt, and more waiting. How will I walk through these trials and remain strong for my family? I am choosing peace. I am going to commit to, lean on, and hope confidently in my God. I just took this closeup photo of the glorious colour and detail of a portulaca in our flower bed. I am breathless and awestruck again and again when I catch a glimpse of what our God has created. The beauty that surrounds us cries out His majesty. Yet even as I celebrate what I can see, how much more will we celebrate the glory yet to come? Kim said: This week I am changing up the tone just a bit, but you will still be blessed in a big way. I want to talk about miracles that have happened in your personal life. Remember miracles come in all shapes and sizes; don’t get caught into thinking of one way only. In as much detail as you would like to share, please tell me a “miracle” that has happened in your own life. Let us share the wonderful works of our Lord together this week! For 30 years my tobacco habit grew, until even as a fitness professional I was smoking 3 packs of cigarettes a day. I could not even conceive of a way to quit, it seemed the task was overwhelming, too large to imagine. On Thanksgiving Day (the American holiday, I wasn’t yet in Canada), about one month after I had come to know Jesus and been born-again, I knew I was no longer alone, and need not rely only on my own power. With a box of nicotine patches in hand, I sat down and spoke to God. I admitted to Him that there was not any possible way for me to quit by myself, even with the patches. I needed His help, and would leave it all in His hands. That evening, I counted down the cigarettes left in the pack, until I found myself smoking the last one. I would not use a patch until the next morning, for I knew I had no cigarettes at home, and all stores where I could buy them were closed for the holiday. I spent time reading all the information about using the patches, and the list of symptoms and problems I would have. Then I prayed again. I gave Him my addiction. I could not believe how remarkably easy it was to never light another smoke! I know the patch took care of some of the physical cravings, but according to the literature, I should still have difficulties. It was very clear to me that God has been faithful to me, and it was His work that kept me from wavering. My God had delivered me, and I could not keep silent. In a great move of boldness, I began to tell people who had never known of my habit, (clients and students that I hid my addiction from, realizing the contradiction in lifestyle) that I was quitting. It was a great opportunity to witness to the wonders of our Lord. Anytime someone would ask how I did it, I would smile, and give them a joyful answer. "It was easy. All it took was a patch and a prayer." I will indeed shout praises to the One Who called me out of darkness. I will continue to tell of His wonderous deeds. I will worship Him not only for what He has done, but simply for Who He Is! What miracles has the Lord done in your life, big or small? Come share at Cafe Chat. streams out of the hills and through the valleys. Last month at the A Woman Inspired - Online Ministry Conference I learned much about social networking. I spend more time checking Facebook and Twitter now, perhaps too much time, but that's an issue for a different post. 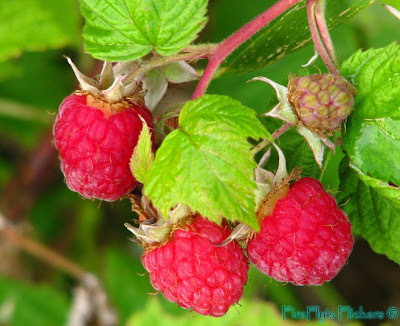 I felt led to dig into what the Word has to say about the "tongue"
Every year on Canada Day admission to our nearby National Park is free and we decided to spend the day driving about, admiring God's beauty and meeting friends for a cookout dinner. I wanted to share some of the pictures Rick snapped along our way. One of the out of the way, quiet lakes where we had time to be alone with God. This is one of the pelicans we encountered. It's mate was not far off. Rick and I were blessed to spend Canada Day last Wednesday in the national park close to home. 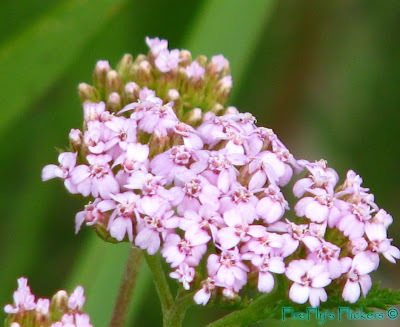 Rick with his camera has given me many inspiring photos to use in my blog posts. As we were driving down this road I felt led to ask him to stop and take photos from both directions. I wasn't sure why until I sat this evening looking at them both. This was the view of the road behind us. It looks fairly straight and you can see for quite a distance. It's similar to the kind of vision we have when gaze at our past and where we've been. There's not much to surprise us as we look back, and not much to fear. We can settle in and get comfortable and live on the memories. But, I know that's not what God's plan is for us. He places a road before us, and desires that we step out in obedience and in faith. This was the view of that road ahead of us, with a turn that leads to somewhere that we cannot see. That's where the trust comes in. Can we have enough faith to believe that God is waiting to take our hand and walk each step beside us? Today I choose to take a step, however small, down the path the Lord has set before me, even if it feels safer to stay still. For in that movement forward, in that act of obedience, His promises will be activated. I am Undone by "Scared:A Novel on the Edge of the World"
I have spent much of the past two days reading the first novel by Tom Davis called "Scared: A Novel on the Edge of the World". If this was simply fiction it would have been an easier read, but there is so much fact, so much sad truth behind the story that I frequently broke down in sobs and tears and needed to take breaks to dry my eyes and deal with ever running sinuses. I found myself praying often. For Africa, for the children, for the desperate. And I prayed for those of us who walk in freedom and comfort and riches and yet grumble and complain about petty and trivial inconveniences in our lives. If you can read Tom's novel and remain untouched then you have been formed of steel, not flesh. I challenge you to read this and allow your heart to be broken for the things that break the heart of the Father. I have to confess that I love the moments when I can grab Rick's camera and wander about our yard, never quite sure what lovely pictures I might catch or what God might choose to speak through them. When I look at the strange beauty of the bud on this bachelor button plant I realize that although I can expect it to be like the other flowers on the plant, God alone knows exactly what it will look like as it unfolds. I'm sure there are hundreds of billions of bachelor buttons and yet each separate flower is unique and precious in His sight. How much more does He know and see and care for each of us? This week Kim posed the following question: When it comes to an issue or truth that you believe in, maybe even feel like God revealed that truth to you; how do you respond to another Christian that might have the opposite view from you? Do you feel like the way you respond lines up with how God would want you to respond? I have struggled with an interesting twist to this issue. Even when I knew, that I knew, that I knew that my Lord had revealed something to me, if it ran contrary to what others believed I would begin to doubt that I heard correctly. I have learned to trust His voice, whether it is a whisper or a shout. The Lord is also teaching me that everyone has their own understanding, and though truth is truth and not relative we are all on different points along the path to His glory. I pray that I reflect His light and His love at all times, both to those in the brotherhood of faith as well as those who have not yet met my Jesus. How would you answer Kim's question? Join us at Cafe Chat and share your thoughts.